North Shore Chateau: Located on the North Shore of Devil’s Lake, the Chateau continues to be a must visit destination within the park, as it has been since 1925. The Chateau offers a wide selection of souvenirs to help you remember your time in the park, including: Devil’s Lake branded apparel, patches, medallions, stuffed animals and home and office decor. 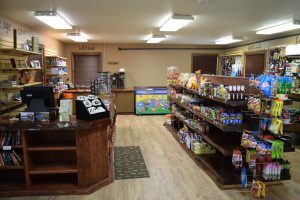 After browsing the souvenirs, stop by the Tumbled Rocks Cafe and enjoy an impressive selection of food items prepared to order while enjoying seating with a panoramic view of Devil’s Lake and it’s surrounding bluffs. Whether you’re looking for a fresh made deli sandwich or a hamburger and fries, the Tumbled Rocks Cafe has you covered. Join us every Friday from June 2nd-Labor day, 5:00pm-7:30pm for a Friday Night Fish Fry. South Shore Concessions: Found on the South Shore of Devil’s Lake next to the Red Oak Shelter. The South Shore Concessions is a cool oasis from the hustle and bustle of a busy summer day on the South Shore. Grab an ice cream treat while you browse for a souvenir. For those who want to enjoy a hamburger or brat without having to drag the grill around all weekend we’ve got you covered. The South Shore Concessions also provides items for campers in the group camp such as ice, firewood, and other camping necessities. 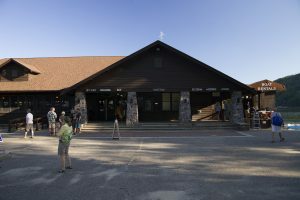 Ice Age Campground Store: Situated between the Northern Lights and Ice Age Campgrounds, the Camp Store provides many camping necessities all while sparing a trip into town. 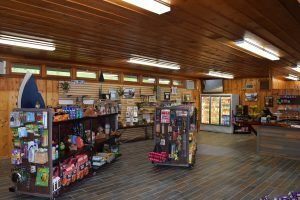 One of two places to buy certified firewoodwithin the park, the Camp Store also has ice, groceries, and cold drinks/beer. Don’t forget to stop in for a souvenir before heading home!